Private tour for up to 4 guests! Board a private seaplane and cruise past downtown Seattle before heading north over Puget Sound toward the wild Outer San Juan Islands--nearly an hour long flight! The islands we fly to are undeveloped, uninhabited and are inaccessible via ferry! Come experience untouched San Juan Island splendor for yourself on this private tour for up to 4 guests! After gliding over the rugged, densely forested coastline, your pilot will bring you in for a water landing at an isolated beach. Once on shore, your wilderness guide will take you on a 2 hour excursion to explore the island's beaches and forests. Enjoy delicious tapas and beverages before flying nearly an hour back to Seattle. Complimentary pick-up and drop off service in downtown Seattle is included as well! Your tour begins at your preferred pick-up location in downtown Seattle where your guide will pick you up in a private tour vehicle and drive you approximately 20 minutes to the seaplane base. You'll meet your veteran pilot and climb aboard a Cessna seaplane and begin taxiing over Lake Washington's calm waters. After take-off, the plane will quickly gain altitude and you'll find yourself soaring over Lake Washington preparing to fly by downtown Seattle. Snap amazing aerial photos of downtown, the Space Needle, boats dotting Lake Union, Ballard Canal, and the University of Washington as you fly just a few hundred feet above the ground. After climbing higher and turning north over Puget Sound, you'll get incredible views on clear days of the snowcapped Cascade mountain range, Mt. Rainier to the south and Mt. Baker comes into view as you fly north. 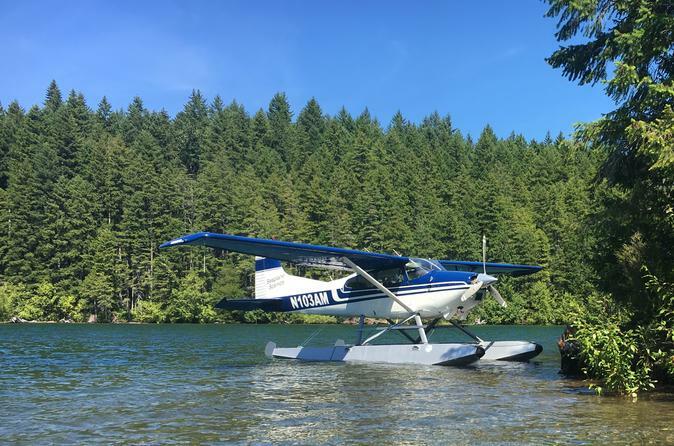 Over the next 30 to 40 minutes, you'll fly over an increasingly rugged coastline as you head toward the wild Outer San Juan Islands. Throughout the flight, your wilderness guide and pilot will share their knowledge with you about the area's history and its geologic past that shaped the landscape that we see today. As you gradually prepare to come in for a landing, you'll spot the densely forested islands encircled by rocky shorelines below. Once making an ocean landing in an isolated lagoon, the pilot will taxi the plane to the beach where you'll get out to explore the island. Last, you'll be treated to a selection of delicious finger food and beverages on the beach amidst the island's natural splendor. After boarding the seaplane, you'll fly south for nearly an hour, flying back over downtown Seattle and coming in for a soft water landing on Lake Washington. Once back on dry land, your guide will drive you back to downtown Seattle to drop you off at a location of your choosing.